Jonathan Lynn is best known as co-writer of the hugely successful Yes, Minister and Yes, Prime Minister with Antony Jay. 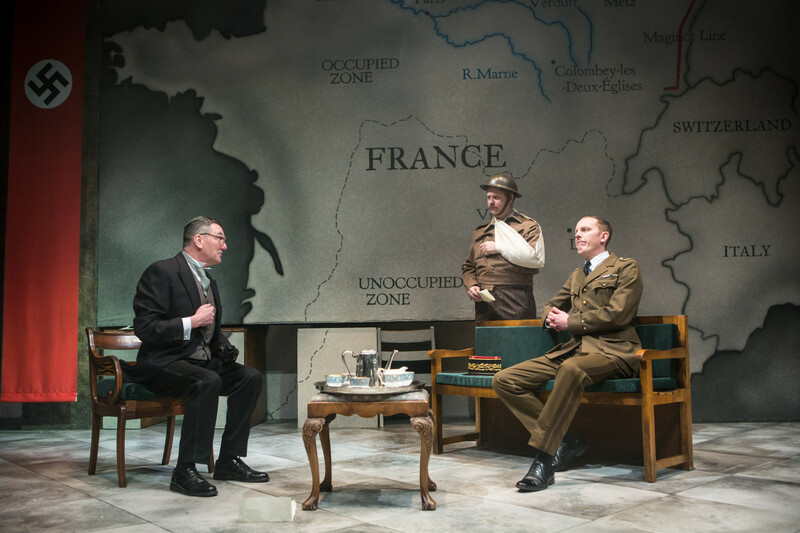 Comedy is clearly one of the weapons in his armoury and his account of the strained relationship between two major figures in modern French history, Marshal Pétain and Charles de Gaulle is nothing if not mischievously revisionist. Pétain is now irrevocably associated with the Vichy government and France’s humiliating collaboration with Hitler’s occupying powers. Lynn however takes rather a different line. 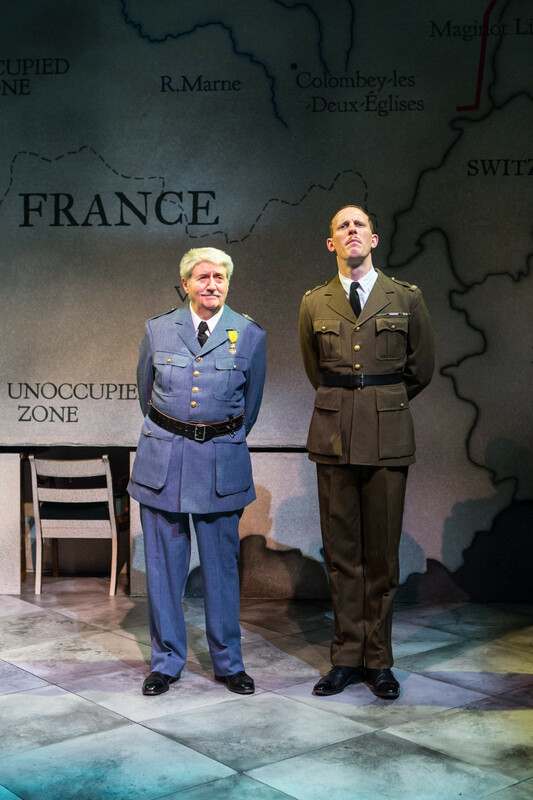 In Tom Conti’s portrayal, the elderly Pétain, a popular soldier who twice `saved’ France in WW1, but well into his seventies when he signed the Armistice with the Nazis, is a benign, kindly figure in a story told in flash-back as he waits after being tried and convicted of treason. On the one hand, Lynn’s intention is to ask how today we are to judge the actions of a man like Edward Snowden by exploring Pétain, the `traitor’ and `De Gaulle, the `war-hero’. I’m not sure The Patriotic Traitor however really sheds much light or answers it though his examination of their strange, symbiotic, father-son friendship challenges conventional notions of treason and patriotism and produces some interesting apercus on character and political destiny. The two were certainly very different: Pétain, the pragmatic soldier drawn to strategic withdrawals, De Gaulle, arrogant, romantic, filled with ideas of `la gloire’ and nationhood, the patriot who `deserted’ his country to set up the Free French movement in London. Ambition, pride and the philosophy of leadership (de Gaulle was a great student of Nietzsche) are all examined against a dominating map of France and the years between WW1 and the end of WWII. Lynn’s writing is workmanlike, sprinkled with shafts of shrewd insight and Laurence Fox makes a suitably stiff and awkward De Gaulle. A raft of subsidiary characters – amongst them the excellent Tom Mannion as various French generals and British’s devious Foreign Secretary, Lord Halifax – add flesh to the great men’s fictionalised discussions. But truth to tell, it all feels a bit ponderous and old-fashioned – a history-bio that only occasionally sparks into dramatic life as if Lynn himself wasn’t quite sure whether he was writing drama or comedy. Still, at a time of such European scepticism, it’s good to see an unknown corner of the French foreign field refreshingly being explored. 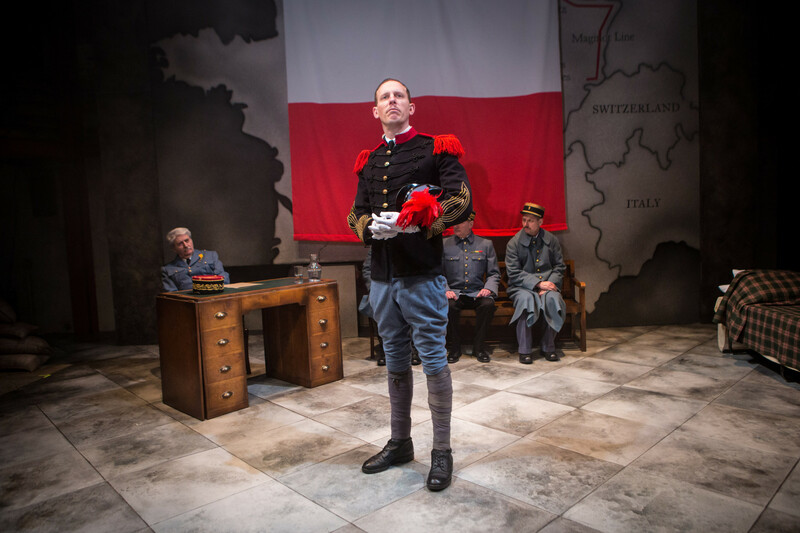 The Patriotic Traitor runs at Park Theatre to Mar 19, 2016. This entry was posted in 2016, Reviews and tagged Edward Snowden, General de Gaulle, Jonathan Lynn, Laurence Fox, Park Theatre, patriots and traitors, political bio-drama, Tom Conti, Vichy government under Petain on February 28, 2016 by Carole Woddis.